Many dream of working by the beach and living in the city, but only a few can pull this off. 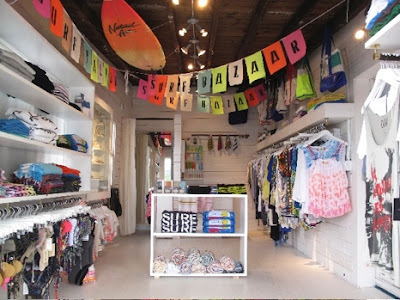 Bethany Mayer lives in NYC, and is the owner of Montauk's Surf Bazaar, a colorful boutique at The Surf Lodge, and the designer behind the store's namesake line, which features simple, sophisticated beachwear. A longtime supporter of ROGAN and Loomstate (both of which are available at Surf Bazaar), Bethany tells us what she likes most about SRF+CTY. What do you think about surf culture in NYC? What's so different or great about it? I think our East coast surf culture is built off of a huge appreciation for the ability to live in a city like NY, but then be such a short distance from an amazing ocean, that is relatively clean, with waves! I am starting to see a lot of West coasters & Hawaiians spending time in the east because the energy around our surf culture is high and built off of this appreciation for access to nature and waves. What's your favorite surf spot in NY and why? Montauk... but I can’t tell you where... but it is not ditch. Do's and Don’ts for surf style? Do: Create a style in both your surfing and your equipment... customized boards! Don’t: wear non-functional things to surf just for the sake of looking good... not cute. What are your surf essentials? Board, wax, leash, always a wetsuit for warmth in this chilly east coast, water… keep it simple. What are you most excited about for SRF CTY? Getting together with some amazing, inspired people involved in the surf culture. These people are my family and it’s great to support and celebrate our culture. Check out Surf Bazaar online and see the collection in person at the ROGAN Store at 330 Bowery!